Basically, The Face Shop created a lightweight foundation duo that seam to be line our second skin with long-lasting w ear, high-definition finishing and no darkening or dullness plus it’s not cakey at all. Knowing that we need to touch up our make when we are on the go or when we travel we prefer to bring on the basic makeup that we need with us. The Face Shop has come with 2 versions the usual foundation packaging with pump and also the convenient to go pact. Both are of the same formulation but in different packaging. Now I can have all-day flawlessness. Before heading out for a long day I would apply this melting & weightless Ink Lasting Foundation Slim Fit that hug on like my second skin coverage, providing that kind of high-definition, airbrush, radiance and lasting effects. Plus it is enriched with Adenosine for anti-aging benefits. Usually I will pump 2 to 3 pumps on my finger tips and then apply them evenly on my whole face or sometime I use my blender to apply the foundation too. I like the smooth and light texture that is so blend able and melt on my skin. It helps to even out my skin tone, create an airbrush and high definition finishing. The Ink Lasting Foundation formulation provides round the clock moisture. As you know hydration is the key to healthy skin as well as your base makeup will stays beautiful. It contains Biosaccharide Gum-1 that provides instant and long-term moisture to the complexion. Unlike Hyaluronic Acid, which loses its moisture as time passes, Biosaccharide Gum-1 gradually enhances its moisturizing effect. Ink Lasting Foundation Slim Fit comes with light fitting formulation which is like my second-skin finish because it contains 2 star ingredients such as Flat Cover Pigment provides natural coverage with its multiple flat layers, which closely adheres to skin. Light as a feather yet incredibly ingenious, Air Pore Powder absorbs 4x more sebum than its own size, preventing excessive shine and improving brightness throughout the day. After I apply this foundation I was out the whole day from 8am, it can last for about 6 to 7 hours before I had my touch up around tea time. And yes, my skin looks absolutely flawless. The Face Shop Ink Lasting Foundation Slim Fit To Go comes in very handy and I love this convenient and hygiene packaging. When I need a quick check on my makeup and touch-up. It is perfect on-the-go as foundation and touch-ups anytime and anywhere. It has the same formulation as the foundation but different in packaging only. I am glad that the texture is light so when I touch-up it does not leaves the cakey finishing or the crack line. It matches the skin tone and doesn’t caused oxidation, dryness or dullness. The new Slim Fit To Go Foundation come with contactless pump to prevent bacterial contamination, just press to dispense. And use the puff to pick up the foundation. he soft rubycell puff makes each application so easy, fast, just dab dab dab gently and you’ll get the air-brushed, poreless finish every time. This is an award winning foundation that gets the seal of approval from Korean media too. Korean beauty specialists gave it a score of 4.8 out of 5. It granted GLOWPICK 2017 Consumer Beauty Awards as Foundation Winner. Overall, if you are looking for a hydration and lightweight foundation that can gives you medium to high coverage, long lasting wear, flawless finishing and radiance skin then the The Face Shop Ink Lasting Foundation Slim Fit and Slim Fit To Go duo is perfect for you. Now your makeup is full-proof from day to night, from bedroom to ballroom. Head over to The Face Shop store to try out the texture and see the effects on your own skin. Or you can also test the products at The Face Shop Beauty To Go Tour Mobile Truck that is happening in Klang Valley, Penang and Johor Bahru. For oily skin: mix foundation with primer. This will boost the lasting power of your foundation by mixing it with a drop of primer. After application, blot skin gently with tissue before following with pressed or loose powder. For dry skin: spray puff applicator with face mist. To prevent a cakey finish with a damp sponge. For a dewy, streak-free application, use patting instead of rubbing motions to apply foundation. Availability: The Face Shop Ink Lasting Foundation Slim Fit & Slim Fit To Go are now available at all The Face Shop Malaysia outlets nationwide and e-Store. 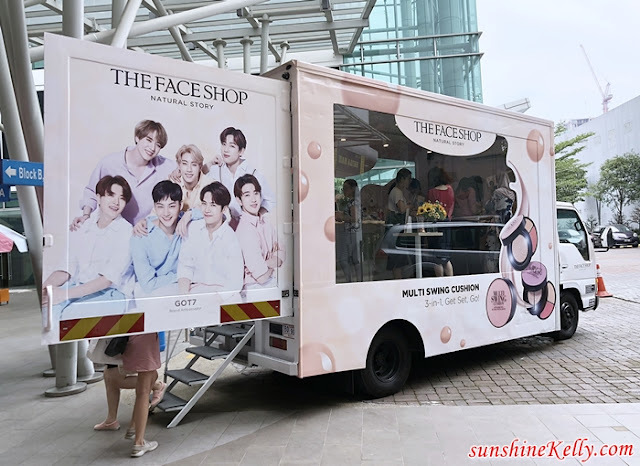 Faceshop Mobile Truck ni best gak ni. Selalu nampak food truck ajer. Teringin juga nak try foundation. Tapi ni liquid kan?. Tak suka sangat dengan liquid sebab terasa kulit macam tebal ajer. Dulu mmg pakai foundation. Sekarang sekadar pakai Bb or Cc cream sb malas nak pakai tebal. Nampak make up Kelly sangat cantik gunakan Face Shop. Nice!! Ala dah terpadam komen 1st. Lol. Biasa Bella jarang pakai foudation. Sekadar pakai BB n CC cream je. If ada event penting br pakai foundation. Nampak make-up Kelly cantik pakai The Face Shop. Nicee! Sis dah lama tak pakai foundation..just pakai bb cream sahaja, cepat n mudah. Tapi kadang2 foundation ni mmg perlu utk ke majlis2 besar. You're really a pro when it comes to make up. I pening just reading what goes where, and to be honest, liquid foundation has always been a struggle for me to use. However, after reading these benefits you have shared, I feel like getting a bottle for myself as well! Liquid foundation ni selalu hilang bila I pakai. Macam tiada fungsi. Wuwuwuwu. Hopefully ia serasi dengan kulit rakyat Malaysia yang sentiasa berpanasan. Hehe. Face shop not bad juga kan. I guna produk skincare mereka. Memang bagus.